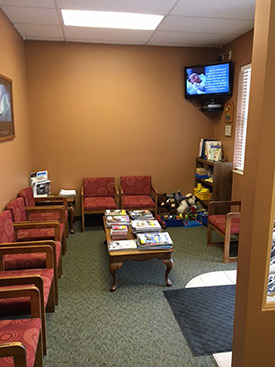 You will always feel welcome at Parks Chiropractic Health Center! We pride ourselves on having a warm, friendly environment. Our team is ready to welcome your family and make you feel right at home! Our front desk staff is ready to greet you as soon as you arrive. We’ll ask that you sign in and fill out the new patient paperwork if you hadn’t already downloaded and completed it from our website. A staff member will walk you back to the examination room to go over your paperwork and answer any questions you may have. Dr. Parks will then introduce himself and proceed with a consultation and examination. If X-rays are warranted, we’ll take them. You may receive trigger point therapy or an adjustment, depending on what is needed. This visit takes 30-45 minutes. Afterward, you’ll be scheduled for a follow-up appointment. We’ll be ready to go over our findings from our first visit when you arrive. If X-rays are taken, Dr. Parks will walk you through what he’s found on them. We may do a brief examination again to be certain that X-rays aren’t needed. Dr. Parks will spend some time going over his recommendations for care with you. You’ll receive trigger point therapy or a light adjustment, depending on your needs. This visit usually takes less than 30 minutes. When you arrive for subsequent appointments, you’ll sign in and get your adjustment. If you don’t already have multiple appointments scheduled in the future, we’ll let you know when we need to see you next. You can then schedule at the front desk. These visits are shorter in time depending on the necessity of the patient. We recommend you schedule future visits so that we can see you promptly during your appointed time. As we keep seeing you, we’ll address any concerns that may come up. Dr. Parks and our team enjoy getting to know our patients and their lives. If anything happens we can help with, we’re happy to discuss that with you. I’ve been seeing Dr. Parks now for over 10 years. I’d highly recommend him to anyone looking for care in Monroe. Chiropractic is much like dentistry in that it can be used to prevent future problems. If you put the time and effort in to take care of your teeth initially, you can get your problems corrected and stabilize your oral health with regular monitoring. Chiropractic care works the same way; you don’t have to go for the rest of your life, but if you have a spine, it should be checked. You go to the dentist twice a year even if you don’t have problems because often they may be something you can’t see. Your spine is constantly taking abuse. Minor misalignments can occur that you don’t know about, but that a chiropractor is trained to find. It makes sense to follow up and stay under regular care instead of waiting for a crisis to flare up and losing any progress you could have been making. We leave the decision of when to return up to you! Emergency hours are available. With X-rays on-site, you can have all your needs met at our location. Schedule your time today!